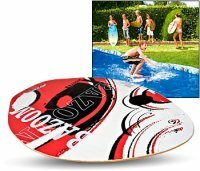 No need to pack up and travel for miles just to get your surfing kicks in as long as you have the Skimboard Surfer. This nifty home-based device will bring all the fun of the beach to your backyard, as long as you own a decent-sized pool to go. With a 26 foot (7.9m) water filled slide and a 30″ pro-quality plywood skim board, this kit will keep kids (and grown-ups who are young at heart) amused for hours. Skim-boarding, if you’re new to this great sport, is a hydroplaning technique whereby the boarder runs at speed towards a thin layer of water, he/she then drops the board onto the water and mounts it with one foot (usually left foot first), the other following in one smooth movement. The boarder will then skim along the surface of the water for as long as he/she can stay upright, and will manoeuvre the board in order to alter direction and perform tricks. The board itself is shaped like a mini surf board but is considerably thinner, as buoyancy is less critical. The Skimboard Surfer will cost you £39.99, but that’s a small price to pay considering the amount of summer fun you’ll experience.